Fitness trackers are more popular than ever with plenty of companies competing for the best device. Most users want their fitness tracker to do it all along with a sleek design and functional applications, which can be a tall order. It’s important for a fitness tracker to have multiple functions because each user will have a different need for their watch. While some like to bike, others want to run or walk or swim or any other number of activities. Fitness trackers also need to be able to give valuable feedback so you can fine tune your healthy lifestyle and perform at your optimal level. Some fitness trackers come with continual monitoring, goal setting, and even sleep tracking options to help you meet these needs. The Polar A370 does its best to keep you in the loop when it comes to your health and fitness with many of these exciting features. The Polar A370 is the improved version of the A360 model. It has similar features, but there are a few new bells and whistles that help propel it ahead of its predecessor. The A370 offers smart coaching that can translate into numerous types of activity, so whether you’re a runner or a swimmer, you can use this fitness tracker to help you meet your goals. The most significant new feature of this tracker is the continuous heart rate monitoring. Even if you are not exercising, the wristband will track your heart rate every five minutes and store that data for you to look at on their app. You can see when your heart rate was the lowest and when it was the highest, and this can guide your fitness routine. You can also track your sleep with the Sleep Plus feature. The watch monitors your heart rate and sleep cycle all night long and then gives you feedback. You can also rate your sleep quality, and the program will add that to their data to provide you with a better picture of your sleep. You can also have the Polar A370 connect with your phone via Bluetooth so you can track GPS while you’re out on a run. All the data collected, for any workout, can also be stored and sent to Polar’s app, Polar Flow, where you will get detailed information and graphs about your performance and day. 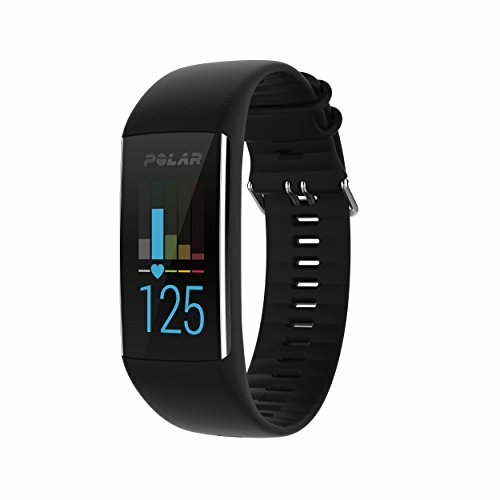 When you purchase the Polar A370, you get the watch and a micro USB connector to charge the tracker and sync data. The A370 is compatible with Apple and Android devices, Polar equipment such as the heart rate sensor or smart scale, as well as third-party fitness apps like MyFitnessPal or Google Fit. This fitness tracker is great for just about anyone looking to improve their health and those that really like to use data to finetune their routine. The ability to send data to third-party apps is a nice touch and allows you to compile as much data on your fitness as possible. The GPS tracking through your smartphone is helpful, but it does mean you have to carry two devices with you when you run to record your information. Concerning aesthetics, the A370 is almost exactly like the A360. There are two sizes, small and medium/large, and it comes in white or black. You can purchase additional wristbands that come in assorted colors. The clasp of the A370 watch is much easier to use than the A360 and features a traditional watch clasp. The touchscreen is rather large, so you can easily see your stats. It also turns on when you move your wrist and gives you plenty of feedback at a glance during your workouts. Overall, the tracker is an excellent tool for you to hone your particular routine better. The review of the Polar A370 can help you go in depth with more of the unique features. The continuous heart rate monitor checks your heart rate at five-minute intervals and gathers more information through your day so you can see how your heart reacts to specific situations. It also picks up when you start a workout and sends continual feedback to give you a better picture of your fitness. Sleep tracking allows you to ensure you get the proper rest and helps you adjust if it isn’t optimal. Smart coaching features enable you to set fitness goals, get activity reminders, set up a running program, and perform fitness tests. Syncs with your phone for GPS tracking and other fitness apps to compile all your data. GPS tracking can sometimes lose connection during your workout if you are in an area with no signal. The battery life might not go the full four days if you use certain features and notifications. People with smaller wrists might find it hard to get the band tight enough to prevent slipping. The cover for the USB port isn’t as secure and can easily be lost which makes it hard to keep the watch waterproof. One of the best things about the Polar A370 fitness tracker is that it can do so much more than monitor your workouts. While that is a critical component of any fitness tracker, it can be helpful for your overall health to get a complete picture of your day. The continuous heart rate monitor is significant in that you can see how your day affects your heart rate. Monitoring your heart throughout the day also gives you a more accurate calorie burn so you can see how your efforts are benefiting your goals. While the HR monitor only checks every 5 minutes throughout the day, during your workout, it is collecting data the entire time, so when you are exerting the most effort, you can get the most detailed data. The Sleep Plus monitoring is perhaps even better than the continuous heart rate monitor. Sleep is increasingly becoming a crucial part of fitness and recovery is almost as crucial as tough workouts. If you can optimize your rest, you will be able to push yourself when you need to most. The Polar Sleep Plus automatically tracks the quality of your sleep and detects any interruptions. You can also set sleep goals such as the amount of time you want to sleep and rate your sleep for each night. With this information, the A370 can give you insightful feedback and allow you to get the best sleep for your needs. Finally, all the smart coaching features of this tracker really help you meet your fitness goals, whatever they might be. You can set an activity goal, and the tracker will help give you the motivation to reach that. There are inactivity reminders that will help you get up and moving as well as show you how the little movements in your day all add up. There is also a fitness test you can take to see how your overall fitness level improves with time as well as the ability to set up a running program to get you ready for a 5k all the way up to a marathon. One way that the A370 helps you improve your fitness is the statistics and feedback you can get. All data that your watch collects can sync with your computer and the Polar Flow app. This app compiles your data and puts it into graphs and charts so you can easily see where you are getting better and the areas that need to improve. If you choose to use your phone during a run or walk, you can sync via Bluetooth and get even more data including maps and mileage. The Polar Flow app also allows you to analyze your workout programs and see where you can tweak certain things. The Polar A370 also gives you the ability to sync with third-party apps, such as Google Fit or Apple Health Kit. This feature is particularly helpful for first-time fitness tracker users who might have been using these other apps to compile their data. Now they can add even more information and have more feedback on their routines and better reach their goals. The A370 also gives you notifications and feedback all throughout your workout which helps you meet any goals you set. You can program your tracker before a workout, and the tracker will guide you through your program to keep you on target. You can save your favorite workouts so you can come back to them again and again and track your improvements. Continuous heart rate monitoring- Throughout the day you the wrist monitor will check your heart rate every five minutes and provide feedback on your levels. The monitor will also kick in with constant monitoring during a workout so you can hone your fitness to your needs. Sleep Plus Program- You can track how long you stay asleep, your heart rate as you sleep, and any disturbances in your sleep. You can also set specific sleep goals which the tracker will help you meet with feedback and insights. Phone GPS ability- If you choose to sync your phone and the A370, you can get information on speed, distance, pace, and routes. You can also get important phone notifications through the tracker when it’s synced so you can always stay connected. Smart Coaching- Meet your goals faster and with more ease through the Polar A370 smart coaching features. Set activity goals, get inactivity reminders, build training programs to master your first 5k or marathon, and see all your stats on the Polar Flow app on your computer. Third Party Syncing- If you already have fitness data through a third-party app, such as MyFitnessPal, you can sync your tracker to those apps as well so you have access to all your health information and feedback. Because there are so many fitness trackers on the market and each one can be better suited to certain activities and peoples, it helps to hear what actual customers think of the product. Overall, most users have been happy with their Polar A370. The biggest praise that most customers give the A370 is that the additional features not available on the A360 really help put this fitness tracker above others. Many users love that they can get feedback on their heart rate throughout the day as well as during their workouts. The fact that the tracker can sync with phones was another bonus because it added to the statistics and feedback people could use to improve their fitness levels. There are a few downsides to this fitness tracker including that occasionally the GPS doesn’t sync and a workout might not record all your stats. This usually happened for users that lived in areas where reception could be spotty and wasn’t an all the time problem. People who had smaller wrists sometimes couldn’t get the watch to stay tight enough, and it would slip around during workouts, which was a minor annoyance. A few people didn’t like the fact that all the changeable wristbands were very sporty looking and they couldn’t wear their trackers with nicer outfits. Not a huge problem, but it would be nice to have a variety of styles to choose. Other than those few issues, people genuinely liked the Polar A370. It provides them with a lot of feedback which helps them take control of their health. Many reported getting PR’s on their runs or strength workouts as well as finally tuning into what was causing some sleeplessness. The tracker was also easy to set up and get everything synced and running. The Polar A370 is definitely a step up from the A360 and offers users even more features that will help them reach their goals. Because it is so versatile, this tracker is a great purchase for the general public looking to improve their health. The continuous heart rate monitor keeps track of your HR throughout the day and can give you valuable information on your health. The Sleep Plus program is a new addition to Polar and helps you get a better night sleep, which is a significant portion of living a healthy lifestyle. The tracker’s ability to pair with your phone or third-party apps makes it easy to track every piece of information about your health and helps you make the best fitness goals and decisions. Beyond all the bells and whistles of the new features, this tracker is a solid purchase for any fitness enthusiast and can help you reach the health goals you set for yourself.